Today’s dentists are relying more and more on digital dental radiographs to better diagnose, treat, detect, and monitor oral diseases and conditions. A digital radiograph is a type of X-ray that uses digital X-ray sensors instead of traditional photographic X-ray film. This produces enhanced images of the teeth, gums and other oral structures and conditions. Digital dental images can be obtained through three methods: direct, indirect and semi-indirect. The direct method uses sensors placed in your mouth to record images. The use of an indirect X-ray film scanner allows you to view traditional dental X-rays as a digital image. The semi-indirect method benefits from a combination of sensors and a scanner to change dental X-rays to digital film. 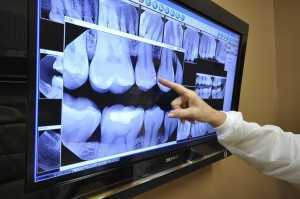 Digital dental X-rays can be taken inside or outside of the mouth. The most common type of dental X-ray is the Intraoral X-ray which provides great details and can be used to detect cavities, check the status of developing teeth and monitor tooth and bone health. Extraoral X-rays are used to detect impacted teeth, monitor jaw growth and development and identify problems that are developing between teeth. They can also be used to look at the jaw and temporomandibular joints and other facial bones. These x-rays are taken when the patient bites down on film. They show the upper and lower teeth in one area of the mouth. Each bitewing x-rays shows a tooth from its crown to its supporting bone and can show decay between teeth and changes in bone density that are caused by gum disease. They can also determine the fit of dental crowns and restorations along with the integrity of fillings. Periapical x-rays show the whole tooth from the crown to beyond the root tips to the supporting bone, however, only one area either the upper or lower jaw is shown in each x-ray. These x-rays are used to detect root structure abnormalities and surrounding bone structure irregularities. They can also show bone loss around a tooth. This type of x-ray is good for treating conditions liked advanced gum disease, periodontitis and endodontic lesions or abscesses. Panoramic x-rays use a machine that rotates around the entire head and shows the entire mouth, including the upper and lower arch, all in one image. This type of x-ray is used in planning dental implants and detecting impacted wisdom teeth and jaw problems. They can also detect bony tumors and cysts. Used to examine structures that are hard to see clearly, this x-ray shows a slice of the mouth while blurring all the other layers. The interior structures are shown as a three-dimensional image when this type of tomography is used and can help with identifying problems with facial bones. These projections show the entire heads and are utilized to examine the teeth in relation to a person’s jaw and profile. Although dentists use this, it is more commonly used by orthodontists. Dye injected in the salivary glands during this type of imaging identifies any problems with the salivary glands.